It is perfectly possible for burglars to break into your home through the garage. In recent years, there has been an increase in the cases of burglars entering through the garage door. That is why it makes sense for you to increase the level of security of the door as much as possible. This can be achieved with the right garage door opener and with simple, but highly effective individual measures. The electric operators with rolling code technology have now become commonplace. It makes great sense to invest in an opener of this type as it will offer a much higher level of security. The technology works to change the access code automatically after each use of the garage door clicker. In this way, it becomes impossible for thieves to learn the access code and to use it for breaking into your house. The traditional physical lock is another highly effective security feature which you should definitely consider. It sets yet another barrier to intruders. You can select from different types of locks. The deadbolt ones do their job excellently. If you have a thicker wood door, a mortise lock may be your only option. 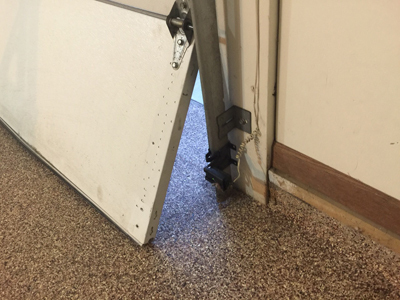 The so called garage defenders are devices which are installed on the concrete base and work to obstruct the movement of the door when they are locked. There are some basic security rules which you must keep. You must never leave the garage motor remote in the car. It is best to keep it with you at all times. You can put it on a keychain and keep it in your bag. You must never leave the door partially open even if you are around the house. An experienced thief can steal your car in minutes even if it's parked inside the garage. 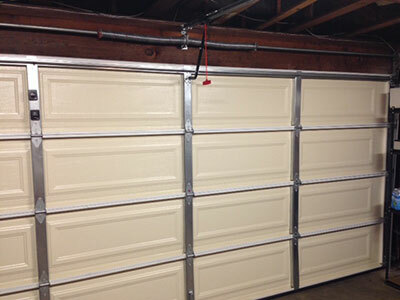 The provision of effective garage door repair is equally important. Broken windows must be replaced without delay. The same applies to the broken panels of glass garage doors. Decaying wood panels can also make the access to the garage and to the rest of the property easier. That is why they have to be repaired or replaced timely. Issues which make the garage door stay open such as malfunctioning safety sensors have to be dealt with immediately. You must not leave the door unattended while it stays open. At the same time, you should not attempt to close it or to fix it as you may get hurt or cause more problems.